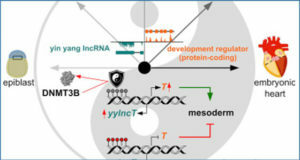 A long noncoding RNA (lincRNA)—called lincRNA-EPS—responsible for regulating innate immunity has been identified by a team of scientists at UMass Medical School. 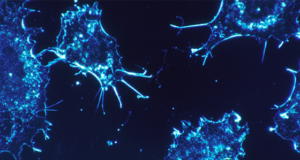 The findings were published in Cell. Katherine A. Fitzgerald, PhD, professor of medicine, is senior author on the study. Abundantly found in macrophages, lincRNA-EPS keeps the genes that trigger inflammation turned off until a pathogen is encountered. This discovery points to an unrecognized role for lincRNAs in the immune system and may lead to new insights into inflammatory diseases caused by uncontrolled immune responses such as lupus or inflammatory bowel disease. 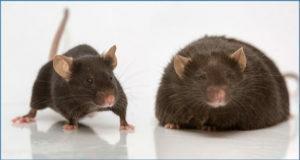 Using a mouse model lacking lincRNA-EPS, Fitzgerald and colleagues showed that in their normal state, macrophages (a type of white blood cell that defends against infections) produce lincRNA-EPS to prevent the spontaneous activation of immune response genes. However, when macrophages detect a potential pathogen, lincRNA-EPS expression is suppressed to release this brake, and the pro-inflammatory response is initiated. 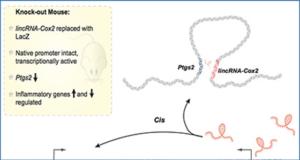 Mice that were lacking lincRNA-EPS exhibited increased levels of cytokines and inflammatory responses that led to toxic shock. 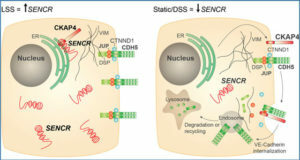 Researchers found that lincRNA-EPS keeps the expression of immune genes in check by controlling the position of the nucleosome so they are inaccessible. 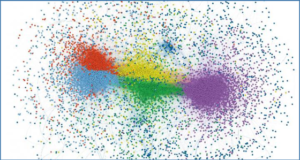 When lincRNA-EPS is no longer expressed in the cells, the structure of the genome changes so critical immune-related genes are exposed for transcription. When researchers reintroduced lincRNA-EPS into the cell, expression of immune genes returned to normal levels. The next step for Fitzgerald and colleagues is to determine what role lincRNA-EPS plays in intestinal inflammation and its function in the colon, where it is abundantly found.